Detail of the conference poster. 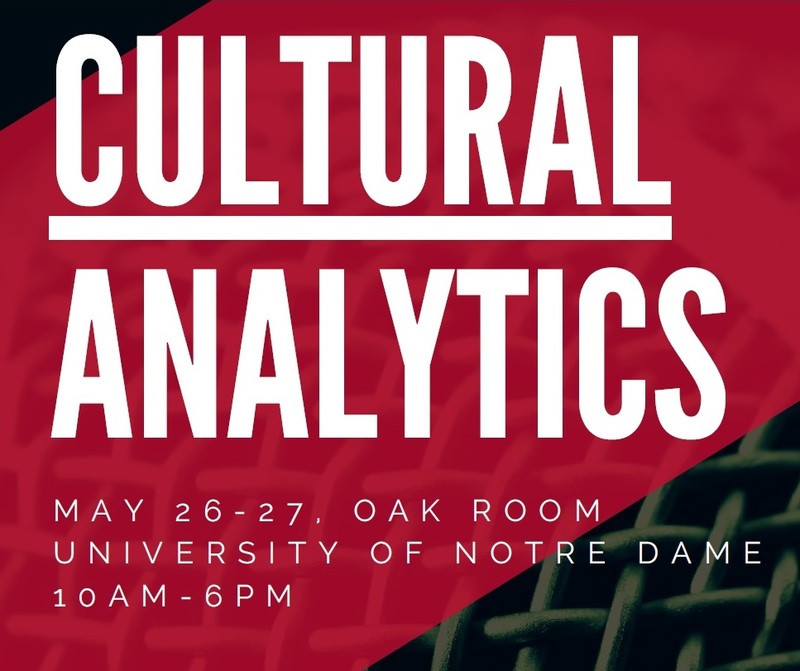 Cultural Analytics 2017 is a two-day symposium at the University of Notre Dame, devoted to new research in the fields of computational and data-intensive cultural studies. Combining methods and insights from computer science and the quantitative social sciences with questions central to the interpretive humanities, the symposium Cultural Analytics 2017 explores some of the most compelling contemporary interdisciplinary work in a rigorous, collegial environment. Symposium took place at the University of Notre Dame, May 26 and 27, 2017. The event was free and open to the public and it was livestreamed online. The archived talks are available on the symposium web site. Lev Manovich gave a talk “What is Cultural Analytics? Four Propositions” at the symposium on May 27. Visit the symposium web site: https://sites.google.com/nd.edu/ca2017/home. Symposium’s schedule and abstracts of the talks are here: https://sites.google.com/nd.edu/ca2017/schedule. Information about the speakers is available here: https://sites.google.com/nd.edu/ca2017/participants. Archived livestreams of all the talks are available here: https://sites.google.com/nd.edu/ca2017/livestream.